Celtic are "still hurting a little bit" from their Old Firm defeat in December and will raise their game for Sunday's derby, says captain Scott Brown. Rangers moved level at the top of the Scottish Premiership after winning the last game before the winter break. But Celtic won nine of their next 10 league matches to open a 10-point gap before the top two meet at Celtic Park. "We had a slight slip up in the last game but we've been on a fantastic run," Brown said. "It just shows how we've bounced back. We were on a great run against them but we didn't turn up and play that well so we need to make sure we are on our game." Since Rangers' 1-0 win at Ibrox at the end of last year, Brendan Rodgers has left as Celtic manager to be replaced by Neil Lennon. The Northern Irishman took charge of 12 Old Firm games in his first stint in charge, winning six, and Brown has hailed the "easy transition" from Rodgers reign. "It's been great to have him back and he's spurred the lads on in the dressing room," said Brown, who ruled out reversing his decision to retire from Scotland duty. "He believes in his own ability to manage this club and he knows how it runs. We had three great seasons here together before and here's hoping there are plenty more. "He knows derbies are very emotional but he believes in us and we believe in him." Regardless of the result on Sunday, Celtic will win the league. But the winter break seemed to rejuvenate them and they are clear favourites for Sunday, given their home record especially. Rangers are on a disjointed run and they need to replicate their performance in the last derby. Can they do that at Parkhead? That's a big ask because they've been a bit erratic since then. 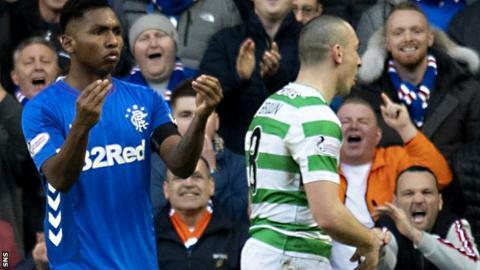 Celtic know how to win a football match, how to get it done, and that is something Rangers need to learn. It depends on personnel for me and it all depends on the midfield battle because Celtic were well and truly beaten in there at Ibrox. I expect a really good performance from Rangers. Steven Gerrard will realise his tactics were wrong in the first game of the season at Celtic Park and they need to get in their faces early and try and dominate them. I can see Rangers getting a draw out of this and it is a big opportunity to show something to their fans.